Tree cutting, pruning, garden services. Patrick and Martin have been calling to our house for years to prune our hedges and trees. 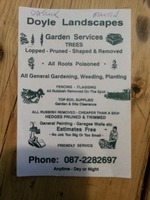 They have always done an excellent job and I highly recommend them. They like to haggle on the price and expect it so don't be afraid to do so! This year Patrick (the father) is driving a white Hiace with Four Seasons written on the van.